Reducing falls for seniors includes modifications around the home, from trouble-free toilets to getting rid of throw rugs that could cause injury. The costs of a fall could be as high as a fatality, as it is estimated that an older American is treated in the ER for a fall every 11 seconds. A nasty fall can derail a senior’s independence, while also adding to a slew of debilitating conditions and issues later. Most of these incidents and accidental injuries occur in and around the home, which makes the argument for mobility devices both a compelling and pragmatic option. Falls around the home are common, and yet, very preventable with some basic ADL assistance and fall prevention. Don’t risk the health and well-being of a senior – take proactive measures to make the home a safer environment. A common point of problems is often the toilet; lowering and raising to use the toilet can easily cause falls among seniors or others with physical limitations. Some options include toilet bars or rails, but also mobility experts offer raised toilets, which decrease the risk of a fall significantly. Wet, slick surfaces can spell trouble for seniors, which is why the shower and tub are the culprits in many nasty falls. Consider installing a shower buddy or using shower seats that facilitate autonomy during bathing; for those with debilitating injuries or disabilities, ceiling lifts or free-standing lifts may make bathing in the tub a viable option. Take a good look at your floors; if they become wet, could they be a potential fall hazard? Also, check for whether condensation builds up on the floor’s surface, due to a humid space, poor ventilation, or temperature differences. Another area of issue is with throw rugs and bath mats, which could remove the problem of moisture, but that can present fall dangers on their own. Make sure to remove throw rugs or floor coverings that cause an uneven surface and that could be tripped over. While it has been mentioned to raise the height of the toilet, did you know that you can raise the height of other fixtures to reduce falls and accidents? Talk to your mobility expert about raising heights of bathroom necessities, such as your vanity, cabinetry, or even tub to create a more accessible bathroom in the home. Small bathrooms may not seem like they need grab bars or rails for users to safely navigate the space, but some may fall by reaching for things that are not intended for support, like the sink, a towel rack, or a shower door. In larger bathrooms, there could be substantial fall risks associated with simply getting from one area of the room to another. Talk to mobility experts about grab bars for the shower, tub, commode, and sink to safely update and upgrade the space. Another versatile option is the ‘super pole’; super poles are basically portable poles that can be installed anywhere that the user may need a bit of support and ‘grab.’ These make any space more accessible and safer, even when you lack the wall or area for more conventional grabbers or rails. Poor lighting opens anyone up to a potential fall, and falls due to poor illumination are most common on stairs or in hallways. Poor lighting also makes it harder to see issues, objects, or fall risks, like a snagged carpet or loose tile, which could present significant hazards for seniors. Clear clutter that could cause a potential fall and subsequent injury. Check their shoes to ensure they fit properly, and that they don’t present any unnecessary hazards, such as long laces. Make sure clothing fits right; surprisingly, many seniors fall as a result of loose-clothing becoming fetched on fixtures and furnishings around the home. Try to consolidate the senior’s needs on one-level, but talk to providers about the viability of a stair lift to help with access throughout the residence. This is a proactive step toward preserving independence, too. 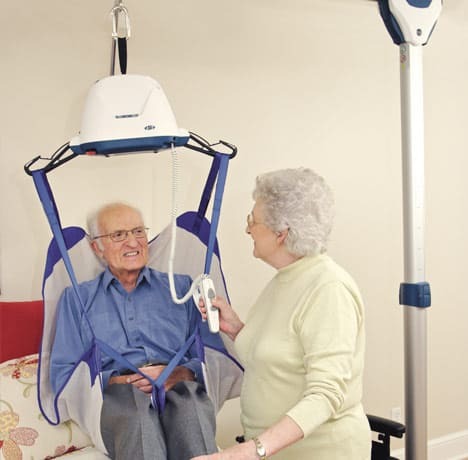 Falls seriously jeopardizes the health and autonomy of seniors widely; mobility aids reduce the risks of a fall and also can assist those recuperating and recovering from an injury sustained in a fall. Falls are not uncommon and can have life-compromising impacts; use these tips to make the home a safer place for a senior that you love. President, Husband, Father, Grandfather Graduate of UC Davis- Bio Sci Major- Go Aggies! Jeff has extensive experience in all of Pacific Mobility’s products and services, and specializes in accessibility products as well as stair lifts, ceiling lifts and custom wheel chairs. His hobbies include spending time with family, gardening, mountain biking, exercising and off road motorcycle riding. © 2019 Pacific Mobility, All Rights Reserved.